This stunning “bizarre” silk robe and petticoat was recently on view at Historic Deerfield, Deerfield, Massachusetts (www.Hist_Deerfield.org). 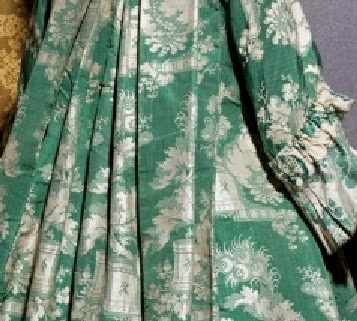 The sumptuous green and white silk droguet (or drugget in English), meaning a fancy silk fabric created with detailed, complicated patterns, was mostly likely woven in Lyon, France. Lyon is recogonized as a premier center of silk weaving during the 17th and 18th centuries. 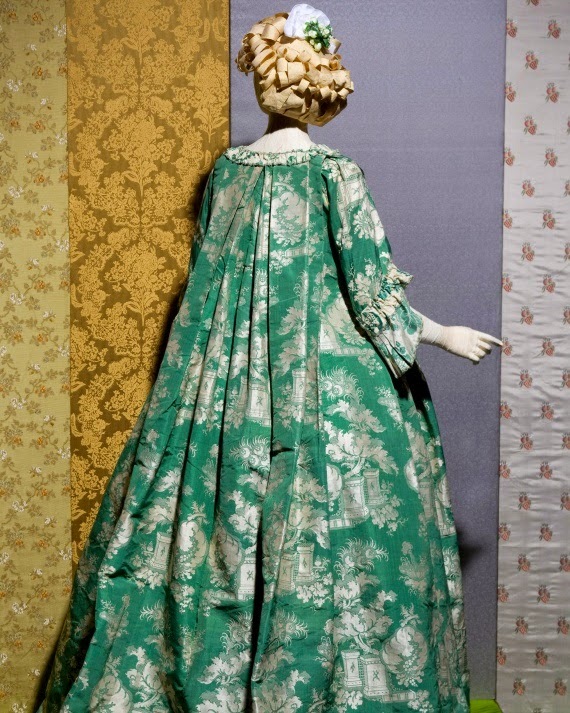 The textile is dated c. 1710s but the gown was made c. 1720 and reveals later alterations. 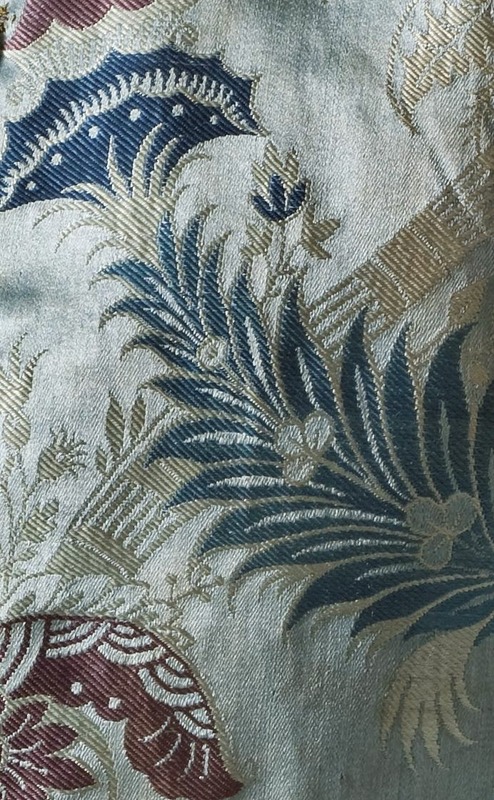 “Patterned silks were one of the most expensive textiles available during the 17th and 18th centuries. The time and effort to draft the design and to weave the pattern added significantly to their cost. In this example, two sets of warp (vertical) and weft (horizontal) threads create a repeating “ bizarre ” design. Popular in the first decade of the 18th century, bizarre silks are characterized by their fanciful design elements, playful use of scale, and a western interpretation of eastern motifs. Textile detail of man’s "bizarre" silk sleeved waistcoat, c. 1715. 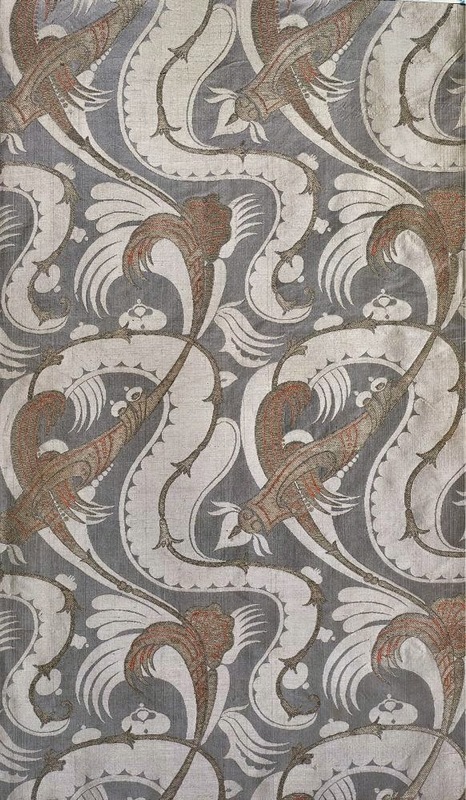 The development of so called “bizarre” designs appear among the English silk weavers of Spitalfields around the same time. Before 1710 bizarre designs combined over-scaled and distorted florals with architectural references, as well as chinoiserie elements. By the 1720s, however, the relatively brief bizarre period was drawing to a close in favor of more natural botanical motives. I can picture it and actually hear the sound of the silk. A statement garment for sure!